To have relationships that are enjoyable, harmonious, and constructive it is imperative that you make people aware of your ethics, rules (or boundaries), preferences, likes, dislikes, and ambitions. The more clearly people understand these things the better your relationship with them will be. First, you need to identify and define these areas for yourself. The most effective way to do that is to put it in writing. If you then review this information until it becomes solid in your mind, you’ll be guided by it. There are various ways to communicate this information to others. You can do it verbally, in writing, and through body language. It is not nearly as important how you do it as it is doing it. This requires conviction and courage. One of the best ways, however, to convey this information is in writing. 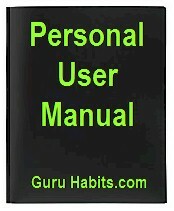 An efficient way to share it is by creating a personal user manual (PUM). Then you can offer it to people who are important to you, especially a lover, to read. Favorite activities, places, & people. Most disliked activities, places, & people. I put together a personal user manual template that you can just fill in. It’s in a Microsoft Word format. After you’re done adding your information, you can secure and share it online by making a PDF copy of it. To share it offline, just print a copy and put it in a soft cover binder with fasteners. You can download the editable Word version here: PUM Template docx.